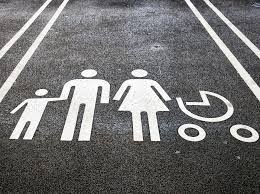 Before becoming a parent I never really took much notice of the Family parking spaces in the carparks, I sometimes secretly envied their proximity to the door when the rain was lashing down but I would never have parked in one of them without a child in the car with me. For a while after becoming a parent I didn't pay attention to these spaces either mostly because they were almost always taken, some genuinely some not. I kind of just figured that that was the way it would always be, tough luck for me if I wasn't quick enough to nab one of these spaces. Me: So are you going to leave her there? Me: In a shocked tone, So you are going to leave her there while you go into the shopping centre? Man: Yeah what do you want me to do, wake her? And off he went! I wasn't quite sure if he was telling the truth as I couldn't actually see into his car, when I eventually parked I walked over and checked and sure enough there was a baby asleep in the back. I took the registration number but I wasn't quite sure what to do, I was still in shock that he was perfectly ok to leave her in there. Not just to run into a shop where he cold see the car still but into a busy shopping centre on a Saturday afternoon, the queues at the till meant he wouldn't be in and out as quickly as he may have hoped. Why would anyone risk leaving their child unattended in such a busy area, or anywhere at all for that matter?! Anything could happen. After this encounter I saw a free Family space further up and indicated in but someone else was just about to pull in, fair enough so I turned off my indicator until I saw that there was no children in this car. So I parked behind and waited for someone the get out but no one did. So off I went over and knocked on the window, I politely asked the woman if she would mind moving as she did not have any children with her and I could really use the space, she looked at me like I had 2 heads. I ah dot remind her she had parked in a Family space reserved for people with children, her excuse? "Well my sister is sick so I parked here". My response was while that was unfortunate she still shouldn't be parking there and would she kindly move. Begrudgingly she reversed out and I drove in. Now I don't want to be an old fusspot about these things or be a pain in the backside for anyone but it really bugs me when people just take those spaces without any consideration for the people who may actually need them. They are a much wider space which means rather than having to set up the buggy at the back or front of the car on the road, I can set the buggy up beside the car safely and just pop L from his car seat to the buggy, this is much handier for me especially when I am on my own, I can grab my bags while not having to abandon the buggy. Same applies when we come back to the car and unload again. People seem to think those spaces are jut there for the fun of it. They aren't, they are there to provide safe parking for parents and children by being closer to the entrance, wider, more accessible etc. I could easily get away with parking there without having L in the car because everyone would see I had a "Baby On Board" sticker and a car seat but I wouldn't dream of using the parking unless I had to. They are not for the lazy shites who can't be bothered to walk the extra few yards form the regular parking spaces. Grrr! Well done to you for standing up to these people. I can't belive that someone would leave their child unattended in the car, truly shocking. What if there had been an accident or she had started choking, or....the list is endless. Poor parenting indeed. I know, you would think even after me saying something to him he would think again about leaving the child in there alone! I just understand some people :/ I would never have said anything before but I just had enough of seeing those spaces abused, the same with disabled space too, some people just have no shame! Well done for saying something! I've never been brave enough but I always want too. It drives me crazy! 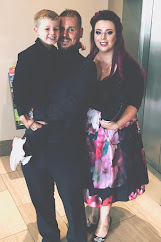 My hubby was in a wheelchair for a while after recovering from a brain illness and we were forced to park miles away as all the parent & child and disabled spaces were taken by people who had no legitimate need for them. As it happened we always had another adult with us, so it wasn't too hard to get everyone safely inside but there would definitely be people who aren't lucky enough to have the extra help. Me and my mum joked about becoming vigilante parking wardens! I wouldn't usually say anything but I just had enough that day! The crying teething baby in the back along with the rain probably gave me the push to say something! haha Another local SC we were on Sunday was totally packed and loads of people thought nothing of going into a disabled spot with no sticker on the car or anything, I would be mortified! Good for you for saying something! I am in complete agreement! Good on you for saying something!! I once saw the woman parked next to me leave her toddler and baby (approx 5 months) in the car while she went in to Tesco. The toddler was screaming his head off. I had Isabelle with me, but waved to the toddler, and played peekaboo to keep him happy in the car until I saw her coming back. I took her reg, but again didn't know what to do. What are some people thinking? It baffles me really! Apparently this happens a lot in this particular car park, members of the supermarket have had to call the police on previous occasions. Well done you. These parking spots weren't there when I had my crew and I would have loved them. In Lisbon last week wheelchair users held a protest and put a wheelchair in every car park spot in the city centre. I saw a photo of it on facebook. It made a really valid point, all these special spots are there for a reason. That's a great idea to get the point across...we may need to do this with the buggy's if ti keeps up too!! The fact that people don't care that they park there is what gets me more...my conscience wouldn't let me do it!